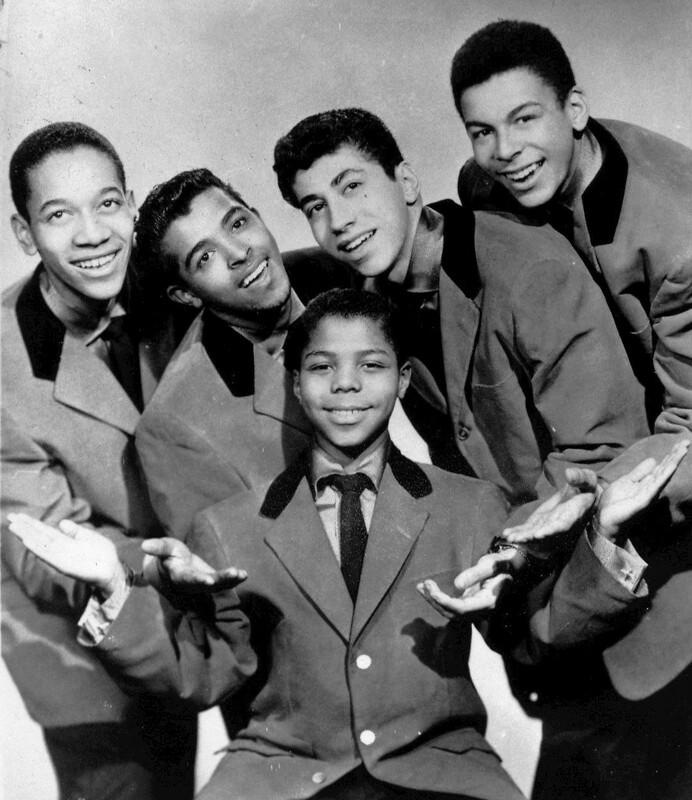 Frankie Lymon and the Teenagers began in 1954 as a singing group founded at Edward W. Stitt Junior High School in the Washington Heights section of Manhattan (New York City, New York) by second tenor Jimmy Merchant and bass Sherman Garnes. They initially called themselves the Earth Angels. Eventually they added lead singer, Herman Santiago, and baritone, John Seda, to their lineup and evolved into The Coupe De Villes. By the end of 1954, Frankie Lymon joined the band and they changed their name to Ermines and later The Premiers. Lymon was born in New York City on December 30, 1942. When he was twelve years old and working in a grocery store, he met The Premiers. Lymon, who was was already singing gospel music in his father’s church, transitioned to secular music after meeting The Premiers. After joining the group Lymon helped lead singer Herman Santiago rewrite what would become their most popular song, “Why Do Fools Fall in Love.” The song got the group an audition with Gee Records in 1955. On the day of the audition Santiago fell ill and was unable to sing. Lymon replaced him. After hearing Lymon sing, Gee Records agreed to sign the band as The Teenagers with Lymon as the lead singer. Released in 1956, “Why Do Fools Fall in Love” quickly became the number one R&B song in the United States and the number one pop hit in Great Britain. Music critics credit the song’s success as the likely result of Lymon’s agile, ingenuous, and utterly charming performance. The song remains one of the key records by which the doo-wop style is defined and remembered. Moreover, its success in an era of racial segregation allowed Lymon to become the first black teenage pop star. The group went on to star in Alan Freed’s package shows and movies and later appeared on The Ed Sullivan Show and American Bandstand. By the end of 1956, after touring through all of the United States and in Great Britain, the group was arguably the most popular band in the nation. In 1956 and 1957 the Teenagers released five more singles which reached the Billboard R&B top ten list, and three of these songs—”I Want You to Be My Girl,” “Who Can Explain?” and “The ABC’s of Love”—all reached the U.S. pop charts as well. As the band toured in 1957 Lymon left the group and began to record solo singles produced by Roulette Records. Lymon continued to make records, as did the Teenagers but neither his solo career nor the Teenagers’ career ever matched their early success in 1956. On February 27, 1968, Frankie Lymon was found dead of a heroin overdose in his grandmother’s New York City apartment bathroom floor. He was only 25 years old. “I’m Sorry” and “Seabreeze,” the two songs Lymon had recorded for Big Apple Records before his death, were released later in 1968. In 1993 Frankie Lymon and the Teenagers were inducted into the Rock and Roll Hall of Fame. They were inducted into the Vocal Group Hall of Fame in 2000. “Frankie Lymon and the Teenagers,” Rock & Roll Hall of Fame, https://www.rockhall.com/inductees/frankie-lymon-and-teenagers; “Frankie Lymon & the Teenagers | Biography & History,” AllMusic, https://www.allmusic.com/artist/frankie-lymon-the-teenagers-mn0000167735/biography.